The JWC stores a total of 40-Million Gallons (MG) of treated drinking water on Fern Hill. 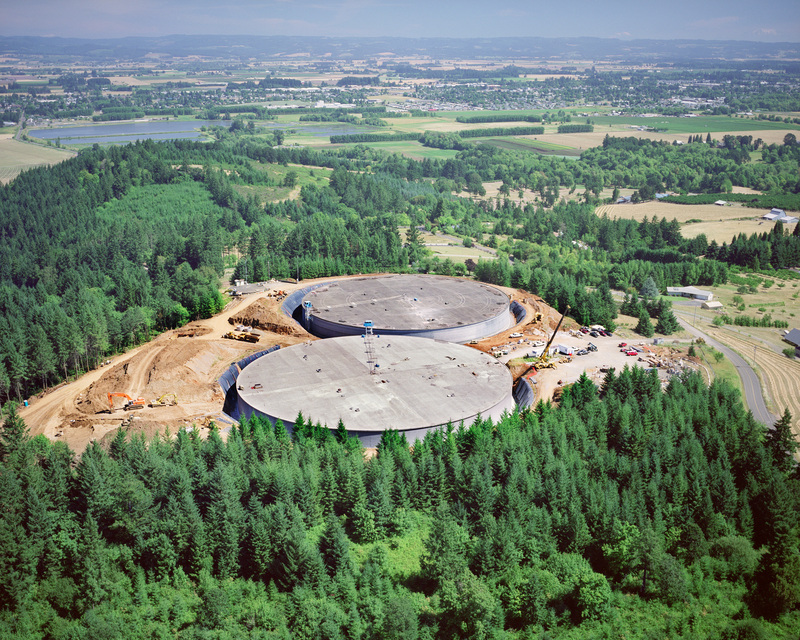 These 20 MG reservoirs are two of the largest potable water tanks in Oregon. Fernhill Reservoir 1 was first completed in 1982 at a cost of $3.3 million. Fernhill Reservoir 2 was completed in 2006. Including rehabilitation of Reservoir 1, the project cost was $17.4 million. Reservoir 2 is wrapped in 141 miles of cable, enough to stretch from Fernhill all the way to Cottage Grove, Oregon. The cable machine wrapped the reservoir at a rate of two miles per hour. Prior to its recent rehabilitation, Reservoir 1 had never been taken off-line in 25 years. Occasional inspections on the tank were performed by specially-trained scuba inspectors.